Which makes the PM for fair dinkumness perhaps surprisingly competitive. Labor has been largely standing back allowing the Liberals to make themselves look ridiculous. Unfortunately the LNP/Liberals have been devaluing the whole currency of politics for a very long time. David Marr told Richard Fidler this began in earnest when Kevin Rudd squibbed climate change in 2010. I think it goes back to the ‘Tampa’ election of 2001 when John Howard made clear he would do whatever it takes to gain and hold onto power. Since then we have had slogans and scare campaigns rather than policy. We’ve had interludes with Kevin 07, and Gillard working with the Greens on climate, but that added to public distrust when Rudd abandoned the CPRS and Gillard so blatantly broke her promise about no carbon tax while she was PM. However, the formulation of questions is problematic, as it assumes a binary where people have to choose between higher household bills and reducing emissions. Labor is going to contend that their policy will do both. 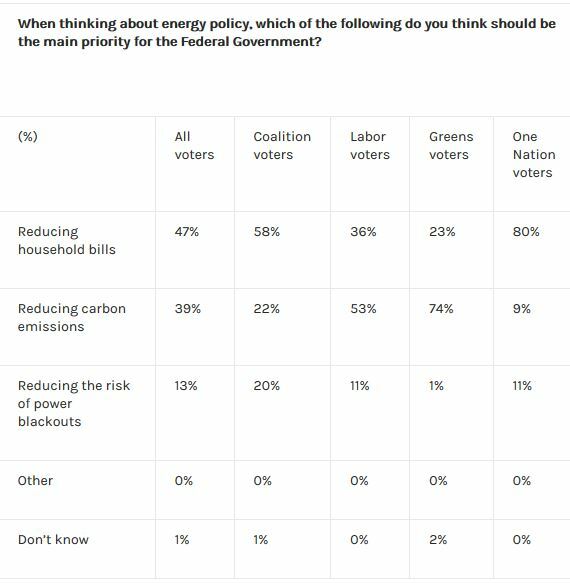 I understand that Labor will stick with its long-term policy of 45% reduction of emissions by 2030, so as not to frighten the horses. Also reports are that they will adopt a form of the NEG (National Energy Guarantee), which after all has been accepted three times by the Liberal party room and represents the best chance of longer term bipartisanship. 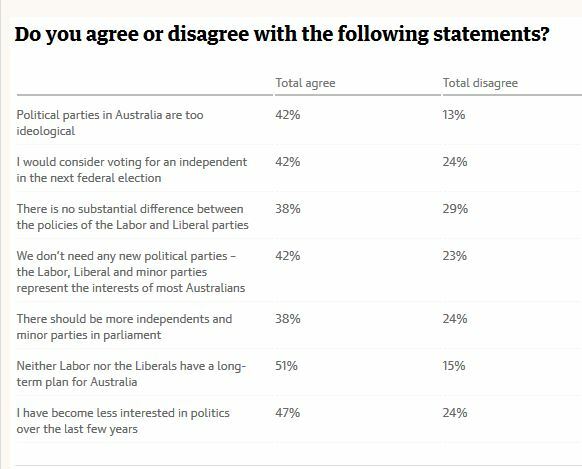 Word is that if they win the next election the best that can be hoped for is that Labor plus Greens will needs a couple of crossbenchers to pass anything in the senate, which makes adventurous policy difficult. Will We Survive Climate Change? Possibly. 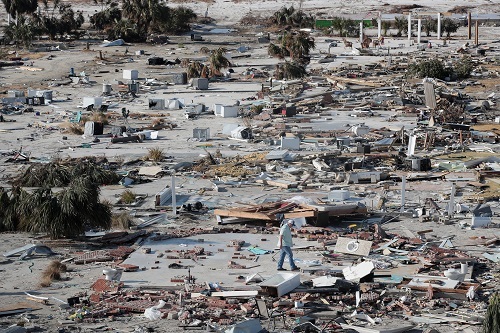 There is ‘no scientific support for inevitable doom,’ one expert notes. From human health to the world’s food supply, from water scarcity to widespread migration and violence, the threats from climate change are much larger than previously thought, a study released Monday suggests. Given the prevalence of climate contrarianism across the Coalition, and the outright denialism of the so-called right rump that seems to hold Liberal leaders hostage, we have to be thankful that climate change is will be one of the leading issues. We can just hope that the voters will play their part. Labor is close to finalising its much-anticipated plan to cut carbon emissions from Australia’s polluting electricity sector, which is expected to include a framework modelled on the now-defunct National Energy Guarantee. The Environmental Justice Australia report The health burden of fine particle pollution from electricity generation in NSW, by Dr Ben Ewald B.Med, PhD, I believe was published today. Agriculture Minister David Littleproud’s political future in limbo. Qld state branch fails to endorse his nomination despite 100% support from his branch. Given that Littleproud is one of the National’s leading performers it seems the current LNP’s capacity to self destruct is still alive and healthy. Cabinet minister David Littleproud was unanimously pre-selected by branch members in his western Queensland electorate in August. But three months on, that vote is yet to be endorsed by LNP officials in Brisbane. The delay means Mr Littleproud is the only sitting LNP incumbent yet to be re-endorsed. Mr Littleproud has been touted as a future leader of the federal National Party, with some in the party keen for him to replace incumbent Michael McCormack after the next federal election. He declined to comment when contacted by the ABC, citing party rules that govern the pre-selection process. The ABC contacted the LNP’s head office on multiple occasions seeking a comment but officials were yet to respond. Party officials held a state executive meeting in Bundaberg last weekend and released a list of MPs they had endorsed to recontest their seats. While some in the party said it was a procedural matter, other sources said Mr Littleproud was out of favour with senior party officials. There are also reports Mr Littleproud’s choice of green office branding has caused consternation among figures within the LNP. When the Liberal and National parties merged in Queensland in 2008 the newly formed LNP adopted a blue and yellow colour scheme for its branding. Party members accused Mr Littleproud of helping moderate businesswoman Susan McDonald beat conservative incumbent Barry O’Sullivan in senate pre-selection earlier this year — a claim Mr Littleproud rejects. Mr Littleproud became the Minister for Agriculture and Water Resources in December last year, 17 months after first arriving in Canberra. He sits in the federal National partyroom and holds the safest government seat in Queensland — the sprawling electorate of Maranoa — with a margin of more than 17 per cent. His influence within Cabinet has come under question since the Liberal Party ousted former prime minister Malcolm Turnbull, who had regularly consulted with Mr Littleproud on drought and regional issues. But Prime Minister Scott Morrison has instead opted for Mr McCormack to support him at drought announcements since coming to power. Since coming to Cabinet, Mr Littleproud launched overhauls of the live export and wool industries, offered a scathing assessment of his own department and reached a bi-partisan deal to secure the future of the Murray-Darling Basin Plan. Mr Littleproud and former deputy prime minister Barnaby Joyce are the main contenders likely to replace Mr McCormack if there is a leadership change. “He’s the new kid on the block, the fresh apple off the tree so it doesn’t have any bugs on it,” a Nationals MP told AM in October. But others in the party say he’s too inexperienced to be a viable National Party leader so soon into his political career. Rebate of $2000 on home batteries, for a household with income below $180,000. Sounds good from what I’ve heard this morning. 50% reductions in electricity and 45% economy-wide. Labor are talking about setting up contracts for new energy through a body like the Clean Energy Finance Corporation. including longer term power purchase contracts. Taylor is just saying labor will put a wrecking ball through the economy, and he says renewables plus batteries don’t equal baseload. No-one said they did. Heard a voice, sounded like R di Natale, saying Labor has run up the white flag on climate change because there was no price on carbon. If that is what he said I find it beyond annoying. In some cases it makes sense to put up the “It might be done this way” when the government start saying silly things like “fossil power is the only way to provide baseload”. Emission reductions have to meet up with practicality, as JohnD, BilB, Brian and others have clearly been insisting…. 1. Anthropogenic climate change is real and poses serious risks for the wellbeing of humans and our societies. These risks rise rapidly and nonlinearly with the rise in global average surface temperature. 2. Recognising that the risks to human wellbeing of unchecked climate change are too high to accept, governments around the world have agreed to limit warming to 1.5-2.0C (the 2015 Paris accord). 3. The carbon budget approach is the most robust way to determine the rate of emissions reductions required to meet the goals of the Paris accord. This approach limits the cumulative amount of additional CO2 emissions that can be allowed consistent with the Paris accord. 4. To meet a 2C carbon budget, a very rapid phase-out of all fossil fuel usage by 2050 at the latest, or preferably earlier, is required. The 1.5C carbon budget is smaller, requiring an even more rapid phase-out of fossil fuel usage. 5. This means that the majority of the world’s existing fossil fuel reserves must be left in the ground, unburned. Furthermore, no new fossil fuel developments, or extensions to existing fossil fuel mines or wells, can be allowed. I think Labor’s energy policy is not sufficiently ambitious, given Professor Will Steffen’s expert statements, and other leading climate scientist opinions. I heard on the radio late this afternoon that Labor is still intending to support gas as a transition fuel – in my opinion, that is a bad move – we need to leave gas before gas leaves us! I heard on the radio late this afternoon that Labor is still intending to support gas as a transition fuel – in my opinion, that is a bad move – we need to leave gas before gas leaves us! I think it is more important to drive the bulk of our power renewable as soon as possible. However, I have no problem with the use of gas to provide some back-up during this transition if this makes economic and rapid transition sense. Geoff M, of course Labor’s policy lacks ambition, but it is a start, is scalable, and is probably all that is politically possible at present. However, he is wrong in thinking there is a budget of burnable carbon. 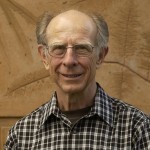 Hansen told us in 2007 that atmospheric CO2 concentrations needed to come down to 350ppm. John, di Natale and Bandt need to look at their underlying values. In their fixation on market mechanisms, they are saying that we need to mobilise the greed of capitalists operating under the profit motive as our main line of attack. I think, and from what you have said you are likely to agree, we need to mobilise the rationality of the state, so we are in control of what the capitalists do. The problem with economists is that they see price manipulation as the preferred way of controlling behaviour. So they love the carbon tax even though it is a tax that can and has been changed by the whim of government. A tax that cannot provide the certainty required for investments in power generation. The problem with the federal Greens is that they have been conned by economists and in denial about what happened to the carbon tax when Abbott became prime minister. What really frustrates me is that they don’t take the effort to talk to fellow Green Shane Rattenbury who has been a minister the ACT government for the last 10 years and a force behind the very successful ACT renewable power auctions. John, that is exactly right. Mark Butler was emphasising that Labor would provide the certainty that renewable energy developers need, which would not be subject to change should the nutters regain political power. Katherine Murphy nailed it talking to Patricia Karvelas last night. You have Labor talking genuine policy on an important matter, which was greeted by intelligent people like Angus Taylor talking rubbish – essentially scary lies. ScoMo typified this with his line ‘Labor has gone from pink batts to pink batteries’. It’s a level of debate that would not cut the mustard in primary school. 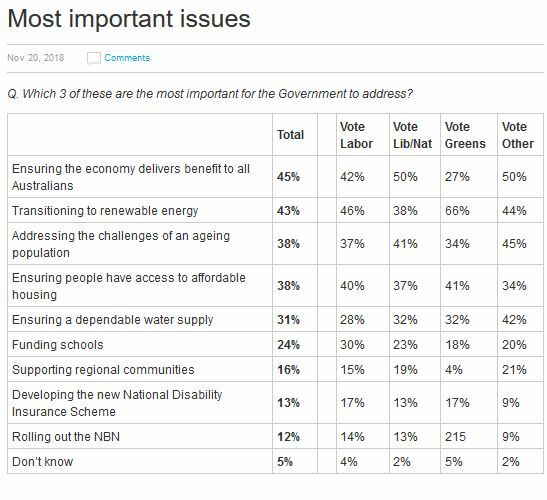 It would have been helpful for the Greens to say, ‘That’s good as far as it goes, but the situation is more urgent and we need to go further faster.’ As it was they were effectively supporting the LNP line that Labor just doesn’t get it and is more interested in wrecking the economy. I think it is more important to drive the bulk of our power renewable as soon as possible. Agreed. But 50% renewable electricity generation by 2030 is not ambitious enough. At current rate of deployment of renewables, we will probably achieve that anyway (or close to it). So Labor isn’t trying hard enough for what must be done – this is pure political expediency for Labor. However, I have no problem with the use of gas to provide some back-up during this transition if this makes economic and rapid transition sense. Well, I do. We must stop burning oil, gas and coal – no ifs or buts or maybes. We need to transition away from fossil fuels (including gas) as soon as possible. Why invest in more gas infrastructure when we must stop burning gas as soon as possible? And we are likely to be entering a post- ‘peak gas’ supply soon – where are adequate supplies of gas coming from to supply more gas infrastructure? All efforts need to be going into renewables – not waste efforts/resources on more fossil natural gas developments/infrastructure. It makes no sense to me that you say: “I have no problem with the use of gas…” Have you been taking in what Brian has been blogging about the risks of increasing GHG emissions? Agreed. The voters need to wake-up to this and push for more ambitious targets – our futures are at risk. 4. To meet a 2°C carbon budget, a very rapid phase-out of all fossil fuel usage by 2050 at the latest, or preferably earlier, is required. The 1.5°C carbon budget is smaller, requiring an even more rapid phase-out of fossil fuel usage. I think Steffen highlights the sense of urgency required. To avoid worse outcomes, global emissions must be cut by half by 2030, and to zero by 2050. This is an unprecedented task, requiring a reduction rate of at least 7% annually; no country has achieved more than 1.5% previously. The only possible response is emergency action to transform our social, economic and financial systems. “Global emissions” means all global emissions, not just emissions from the electricity generation sector. We need to be working towards what must be done (starting with what can be done quickly) , not what’s politically expedient, that risks our lives. Polls untighten as Liberal MPs contemplate the Victorian State Election results. Ambi, I’ve just put up a new post about where we find ourselves as ScoMo’s PMship seems to be unravelling. There is a legacy issue, as they say. Previous PM bequeathed a wafer-thin majority.